I should be in bed right now, but I am choosing to blog instead, because I make poor decisions and don't have good time management skills. That's what my report card would say anyway. Today has been super busy. Tonight was the kick off to the Christmas Open House weekend at Golightly's. So this morning Jennifer, Michelle, and I worked on our space. They stick on with Velcro. Love them! Anyway, if you live in the area, stop by Golightly's this weekend for the open house. You get 20% off your Christmas purchase and you can enter to win lots of door prizes! Yesterday this little girl got to go to the Dr. for her well baby visit! Marcus always has to go too, because I can't hold Katie down for the shots. It just breaks my heart too bad. I don't think he minds coming though, because he kind of likes this baby. Katie is 24 pounds and 31 inches long. She was 7lbs 5oz and 20 inches when she was born. We didn't want the Dr to see the paci, because we didn't want to get in trouble, but Katie spotted it in her bag, so I had to give up the goods. We didn't lose custody or anything so it all worked out OK. I was the most annoying mom yesterday, because when the nurse was asking questions, she asked, " Is she saying at least 3 to 5 words yet?" And I said, "Uuuuh, she probably says 50 to 100 words". Marcus ended up mocking me all day, because I was "that" mom. THEN I was even more super annoying because I started writing down all the words she says after we got home, because Marcus didn't believe it was at least 50. So I made a list! We are up to about 60 now, thankyouverymuch! And they are all real words that she says correctly. It's OK, you can be annoyed with me. You will be happy to know that I got a flu shot, so I have already received my punishment for being lame. 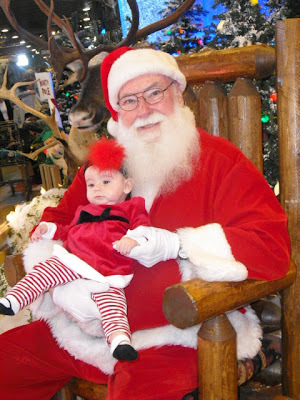 We thought we would do something fun after Katie's appointment, so we went to Bass Pro Shops to see Santa! Katie didn't think it was too fun. She was happy to see him at first when I was holding her. She said, "Hi Santa". (2 of the 60 words she says! :) Then I put her in his lap and she screamed. My mom made that cute sweater she is wearing. Cute huh? She was just chillin' on Santa then! Then Marcus helped my dad hang some Christmas lights. It's super pretty at night. NOW, I need to get ready for 2 fun girls that are coming in town from Arkansas tomorrow! My house is a disaster! I will probably go to bed and worry about it in the morning! Katie is so stinking cute! I kind of love upset kid/Santa pics... is that terrible? Happy Friday Dena! She's sooo cute! I cannot get over how much she has grown in a year. Wow! Katie was probably scared of the giant moose staring at her like she was lunch! Your shop looks great! And the Santa pics are hilarious! I think it just shows how smart she is...I mean he is a stranger. At least that's what I told myself when Sophia hated Santa (still not so sure about him) and all people she didn't know.